There are two essential partners in creativity. We call them whimsy and logic. Whimsy is daydream, flights of the imagination, out of control thinking, intuitive, impulsive, fanciful thinking. Most early learners are naturally whimsical. For adults, whimsical thinking is more difficult because we live in a world where logic is much more valued than whimsy. Why? Logic is much easier to deal with. It’s solid and reliable and you know what you’re getting. The downside is that logic can dominate proceedings which is a travesty because without its counterpart – whimsy – the gift of creativity lies dormant. Together, we’ll use stories, games, provocations and tasks to explore the creative power of whimsy. Dave Brown is a Performance-Maker and the Artistic Director for The PaperBoats. 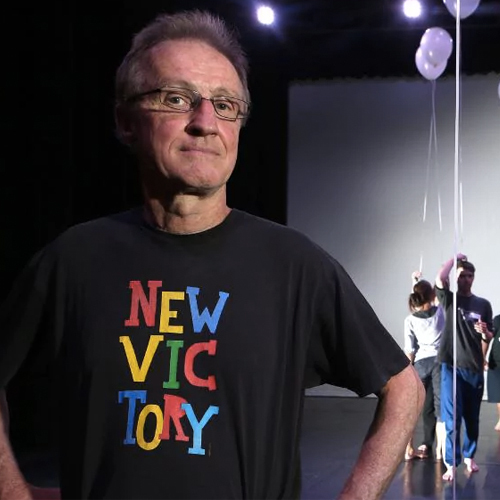 The privilege of being Artistic Director of Patch Theatre Company for 20-years allowed Dave Brown to develop a distinctive philosophy and practice of professional theatre-making for children. Across those 20 years, Dave co-conceived and directed twenty-eight original, devised works for 4 to 8 year-old children, ten of which have toured internationally in the US, Canada, Singapore, Korea, Japan and New Zealand and fourteen of which have toured nationally in extensive Playing Australia tours. In 2016-2017, with the support of an Australia Council Fellowship, Dave kick-started The PaperBoats. The PaperBoats is an international partnership platform for theatre-makers and presenters interested in pioneering new ways of CONNECTING and CREATING around the devising of extraordinary new works for early childhood audiences. The PaperBoats inaugural project is a five-year proof of concept venture involving artistic communities in Australia, Singapore, USA and NZ, who are all devising works for children from a single shared animating idea – “explore two”. The PaperBoats first international work, Especially on Birthdays, a non-verbal visual theatre production about twins, is being performed at the “100 and 100 more” festival.